Lee 4 x 4" Green - CC40G - Color Compensating 40 Resin Filter - Some photographic situations require specific color corrections. For example, when shooting daylight film under fluorescent lighting, some magenta correction is needed in order to remove the greenish tint that would otherwise appear. 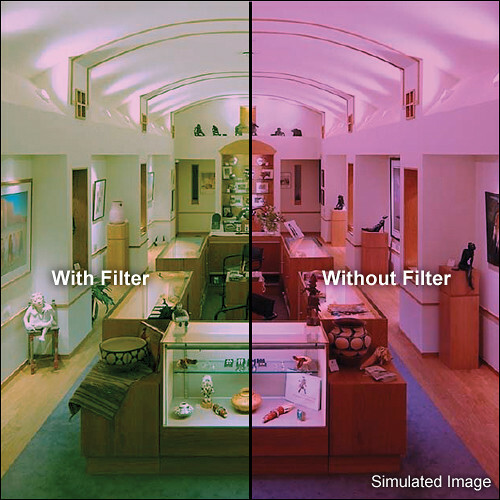 The amount of color correction required is most accurately measured via a color temperature meter. Color Compensating filters are available in the three primary colors: Red, Green, and Blue; and in the three secondary colors: Cyan, Magenta, and Yellow. A typical designation for one of these filters is CC30M. The "CC" stands for Color Compensating. The "30" stands for a density of 0.30 and the "M" is for magenta. Lee color compensating filters are made in the following increasing densities: 0.025(CC025), 0.05(CC05), 0.10(CC10), 0.15(CC15), 0.20(CC20), 0.25(CC25), 0.30(CC30), 0.40(CC40), 0.50(CC50). Box Dimensions (LxWxH) 5.2 x 5.2 x 0.5"